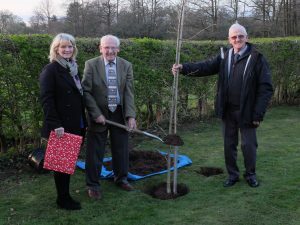 When Nether Alderley was awarded a commemorative oak tree by Manchester Airport, as part of their 80th Birthday celebration, they decided to dedicate it to Norman Moore, who has served as a groundsman to St Mary’s Church and the Parish Hall for over 40 years. On Wednesday evening, March 27th, they held a planting ceremony in honour of Norman in the churchyard. It was attended by Norman’s friends and family, Parish Council members, children from Nether Alderley Primary School and their parents, and Manchester Airport Community Relations team. 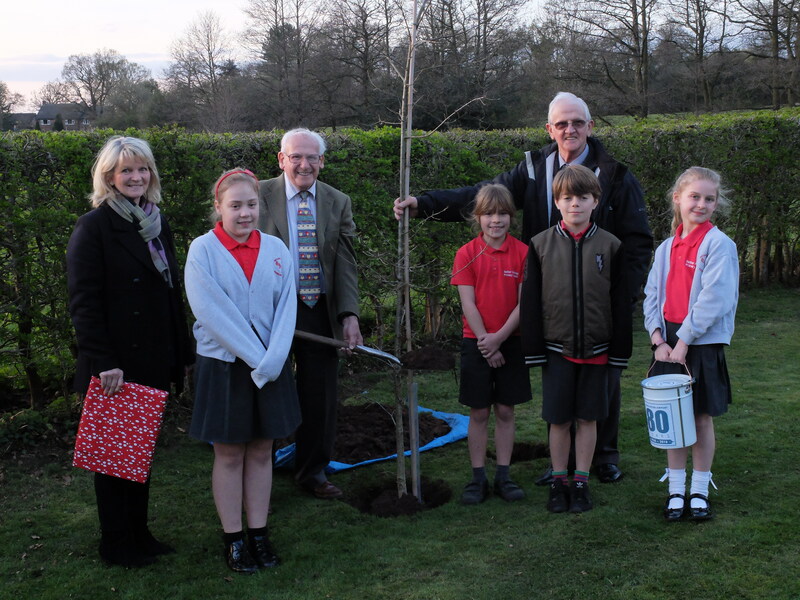 Alongside the tree there was also a time capsule, containing a whole variety of present day artefacts – in particular a project completed by the pupils Nether Alderley primary school. The best suggestions for what the children could include, from Esme, were buried in the container, along with another project based on predictions of what the future may hold! The ceremony was presided over by Cheshire East Ward Councillor, George Walton, who gave a speech and helped the children to plant the tree. Afterwards a reception was in the Parish Hall, laid on by Nether Alderley Parish Council, whose members provided food and refreshments for all guests. 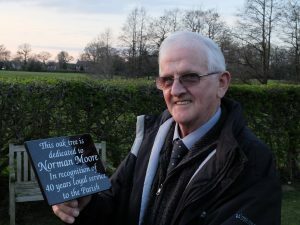 Jenny Shufflebottom, Chair of Nether Alderley Parish Council, said: “Every village needs a Norman Moore! We’re so glad to be able to honour him in this way, and to be able include children from the primary school as well was an absolute delight.